With the impending lockout doom-- DOOOOOOOM-- it's probably for the best that the actual NHL fans actually get acquainted with some other leagues out there. 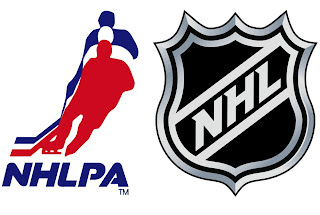 Yes, that's right, folks-- there's other hockey leagues out there besides the NHL. Crazy, I know. So, here we go. For those who know much about the podcast I've been doing for the past 11 years-- Face Off Hockey Show-- you will know that our fan base is far and wide. One of the bigger fan bases is that of the British persuasion and I figured I would help promote their leagues (as wacky as they may be) and maybe get you to look beyond North America. Great Britain is home of the 1936 Gold Medal Olympic winners and the main league is the EIHL, which has seen such former NHL players like Theoren Fleury (Belfast Giants), Nick Boynton (Nottingham Panthers), Eric Cairns (London Racers), and the late Wade Belak (Coventry Blaze) come over and play; though Fleury was the only one not to play during the 2004-05 NHL lockout. The EIHL allows up to 11 non-British players to be on the ice at one time, which means all imports have to have a British work permit in order to play. Sometimes they are not that easy to get, just ask Mike Danton recently. The limit was raised from 10 of 2011-12, which some people don't seem to like because of it taking a job away from a Briton. Though the league says it's to counteract the departure of top Britons to other European leagues, it stymies the attempt to produce more top-end players by taking a spot away. Not knowing much or seeing much of the EIHL, I got the help of Anthony Russell, curator of Banners on the Wall, a blog about the Basingstoke Bison-- formerly of the EIHL and now of the EPL-- to get his take on the EIHL. Russell said that because of the influx of North American players who couldn't make it in the North American minors, the league feels more like a low-AA hockey league in North America with a lot of physical play and fighting. The 10 team league has four teams from England, four from Scotland, one from Northern Ireland, and one from Wales. A league lower than the EIHL is the EPL, which is a semi-pro and developmental league. Only those with European passports, residency, or of British heritage (mother or father with British citizenship) can play in this league. Those players without those key things are imports and teams can sign as many as they want. The import rule only has a team rostering four a game and three on the ice during any time of the game. Russell let me know that there is a two-minute-penalty for too many imports on the ice. About the game play, Russell said, "Because it's easier to sign Europeans, the game has a very European hockey feel to it, but also some touches of British physicality." Another side to the EPL is the ownership situation. There's a vast difference on who owns the teams and how they could be run. Russell mentioned that the Guilford Flames are owned by a millionaire, while the Telford Tigers are owned by a trust made by fans who pay into it. If you buy one share of the team, you have a say in how they are ran. There is another newly formed NIHL, which is a Tier 3/4 league that has a lower import rate and all of that-- but more of a development league for the EPL and then EIHL. Where British hockey really differs from others is the mentality over trophies. Britain is a football (soccer) country so playoffs, whilst part of hockey aren't the be all and end all. Really in British hockey, the main prize is the league title. You play your 54 game season and the team who wins the league title is generally the team regarded as the best. This is partially because that's how we're wired in Britain; anyone can win 1 or 2 games but being consistently good over 54 is what makes you good. Playoffs are the same for EIHL and EPL. Both are 10 team leagues so teams 1-8 qualify. Weekend after the regular season is done you have the Quarterfinals; 1st plays 8th, 2nd plays 7th etc over 2 legs (generally Saturday and Sunday) home and home, highest combined score over the two legs wins. The four winning Quarterfinalists qualify for Finals weekend the next weekend. The leagues hold them at different venues and generally on different weekends, the EIHL at the National Ice Centre in Nottingham and the EPL at the Skydome Arena in Coventry. Saturday, you get the two Semifinals and Sunday you get a junior game (generally, the Under-18s National Playoff Final) followed by the finalists battling it out to be playoff champs. It's different and sounds daft to North Americans but fans from all teams in the league will descend on finals weekend to meet up, watch hockey, drink themselves stupid, and have a good time. It's like a big party to end the season essentially, though many would prefer "normal playoffs" for the quality's sake but we enjoy ourselves. There's that-- a first look at the European side of the game. While I want to take credit-- Anthony Russell is the man. You can check out his work with writing for the Basingstoke Bison over at Banners on the Wall and check out his musings on British/European Hockey, wrestling, and other fun things in his world over at Twitter @84arussell. Thursday was the final day of the NHLPA's Rookie Showcase, where the newest of NHLPA members get their pictures taken for their first hockey cards, their images put into the latest EA Sports video, sign some memorabilia and just give some face time to the media. 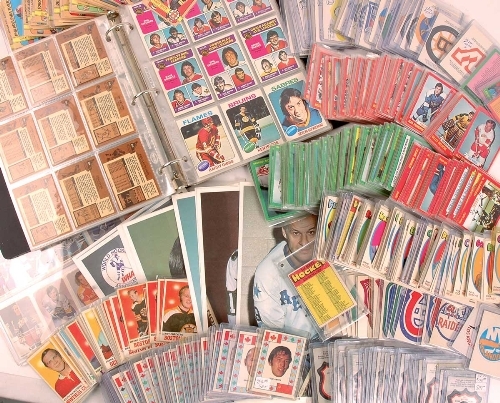 Merchandising has been a big thing in the past decade or so and you often had to wait until the second set of cards to be released in order to get an action shot of the rookies in the league. However, with days like these, they are able to get in on the first set in their new uniforms rather than just their draft pose. The cards factor itself got me thinking as to what my own personal favorite were. 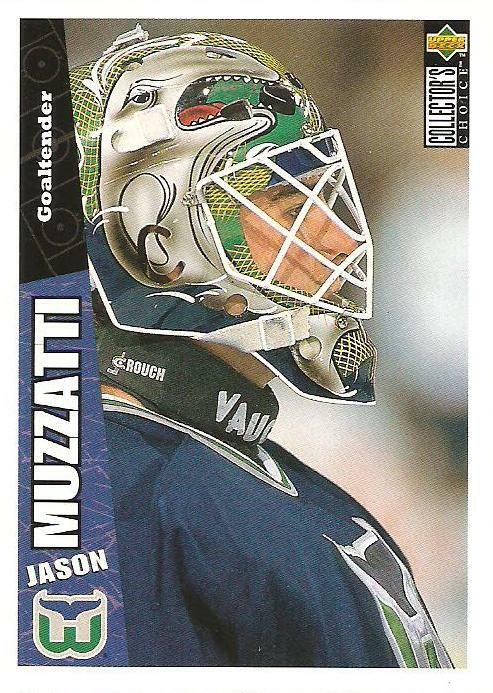 Of course, Upper Deck was the king of the cards in the late-90s and early-00s, having the exclusive NHL license before Panini America got back into the fold. The first set of Upper Deck, 1990-91, could be my favorite of the entire timeline. The design was simplistic, the wordmark at the bottom was a nice nod to the part of the logo sheet that didn't get much notice, and it was a solid design with an ice look of team colors along the border. Upper Deck made an off-shoot of their cards, the Collector's Choice, that started in the 1995-96 season. It was more of a collection that had a lot of specialty inserts in it, which made it more unique than the base Upper Deck brand. It was almost an alternative of the regular cards, with different contests and geared to a younger crowd with their packs. Their "You Crash The Game" cards were interactive and gave the collector a chance to redeem them for bigger prizes should the player displayed get a certain achievement on the date stated. 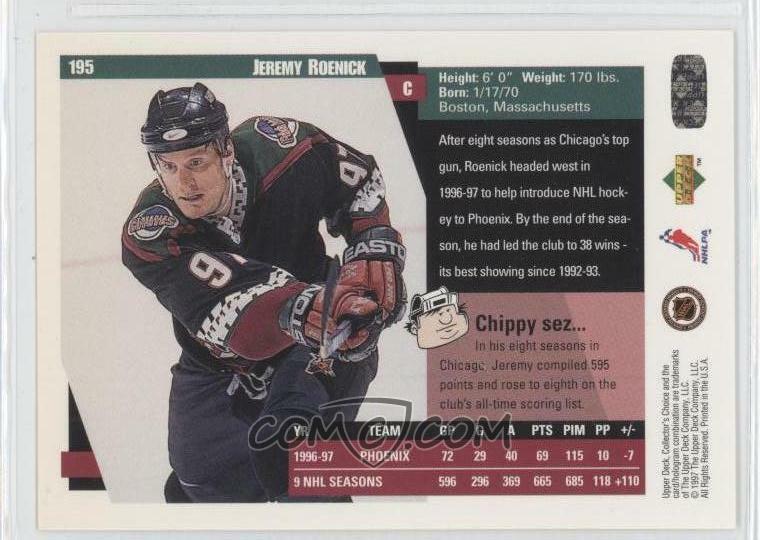 While the first run was nice, the 1996-97 set was a personal favorite for the design that they put out there coupled with the crisp shot of each player, as well as little facts on the back from their little mascot "Chippy." Though, if you want to talk unique cards-- you have to go to Fleer and their set called Power Play, the tall boys of hockey cards. While they were awkward to put into sleeves, the fact Fleer took a different approach to cards was a nice outlook and very kitschy. 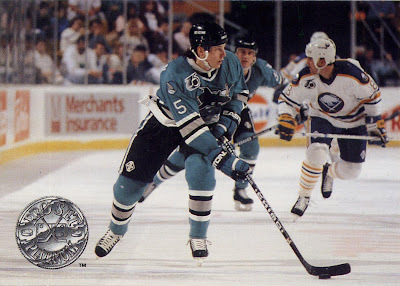 They already had a solid looking Fleer Ultra set with a marble-esque design at the front; the 1993-94 Power Plays were another outlook to the card, even though it was short lived. Yet, one timeless hockey card set is the Pro-Set set from the 1990-91 season. Regardless of all the inaccuracies that the line had for that season, the design is something that has been engrained in our memories-- so much so that the AHL's card set for the 2011-12 season almost mimicked the design of the Pro-Set line. 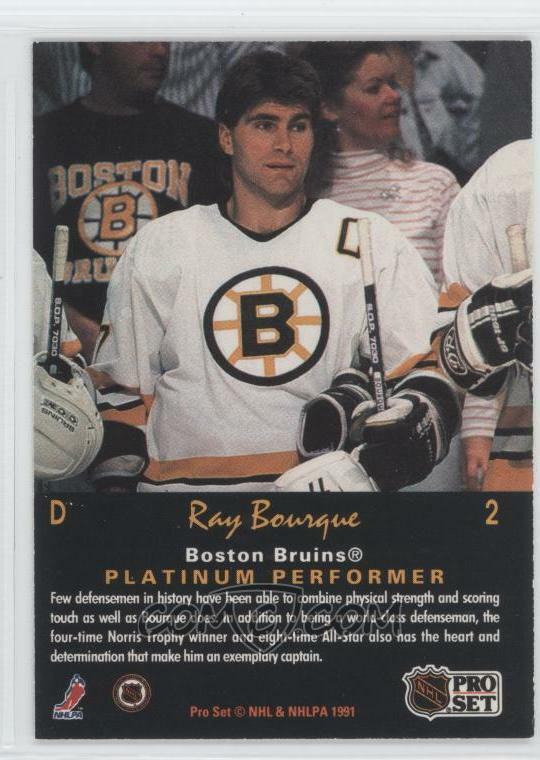 Pro-Set also did a helluva job with their Pro-Set Platinum edition of the 1991-92 season, which was one of the first with a full shot of the card-- no borders, no names-- as well as no stats on the back of the card, either. It seemed to be a higher class of card. 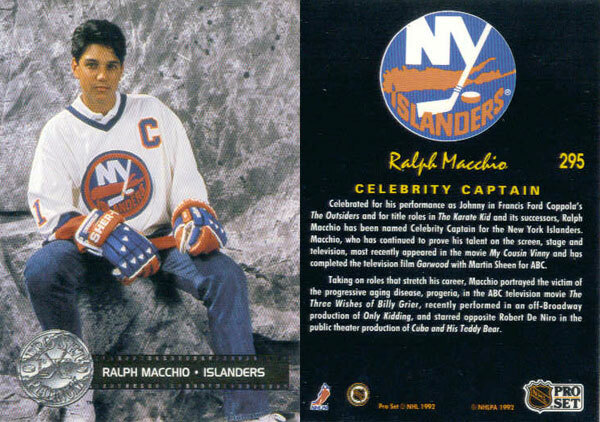 Not only that-- their Celebrity Captain cards were always aces for Hollywood's......elite?? For me, those are the classics when it comes to NHL cards and those that stand out to me. While I'm sure there's others that are memorable, I had to limit some of them. If you've got any you remember-- leave 'em in the comments and enlighten us. Back in the time where the goalie spot was one that was few and far between, goalies would go at great length to keep their jobs. This week's AGM actually needed corrective glasses for his vision, but didn't tell anyone because he thought he would be cut. He would memorized the eye-charts to pass the exam, but it was until late into his career that he got caught when the team switched the chart on him. This week, the profile of George Gardner. Garnder started his career with the Quebec League's Victoriaville Bruins in the 1961-62 season, posting a 28-19-2 record, then going 7-3 in 10 playoff games. The 1962-63 season, Gardner moved to the OHA (now OHL) to play with the Niagara Fall Flyers, helping lead them to the George Richardson Memorial Trophy for Eastern Canada Champions, but losing in the Memorial Cup in six games to the Edmonton Oil Kings. The Boston Bruins claimed Gardner from Kingston EPHL during an Inter-League Draft before the 1963-64 season and sent him to the Minneapolis Bruins of the CPHL for that season, where he would put up a 30-27-6 record in 63 games. Gardner was then claimed by the Detroit Red Wings before the 1964-65 season during another Inter-League Draft and the Red Wings put him in the CPHL with the Memphis Wings, putting together a 25-32-9 record that season. The Red Wings promoted Gardner to the AHL's Pittsburgh Hornets for the 1965-66 season, where he would compile a 34-30-1 record, while also appearing in his first NHL game for an injured Roger Crozier, which he would win. It was a hectic 1966-67 season for Gardner who bounced betwen Memphis (4-9-3), Pittsburgh (18-6-4), and Detroit (3-6-0), but the most interesting part that season was his living arrangements in Memphis. Instead of getting an apartment, Garder was renting a place for $40 a month. This play was a mansion that was owned by a former teammate's mother which had a maid, butler, and chauffeur; who drove Gardner to the rink in a limo. The glamorous life didn't follow Gardner in the 1967-68 season, where he would play in the CPHL with the Fort Worth Wings, playing in 12 games with a 4-7-0 record and then going to Detroit to play 12 games for the Red Wings and finish with a 3-2-2 record. Gardner was picked up by the Rochester Americans in the Inter-League Draft, but would have his rights transferred to the WHL Vancouver Canucks, where he would go 25-18-9 in the 1968-69 season, helping the Canucks in the championship. 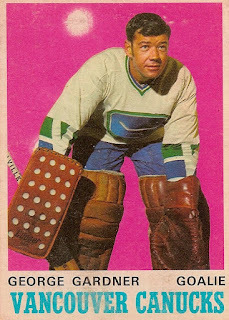 Gardner would stay for the 1969-70 season and have an amazing 41-14-6 record, helping the Canucks win a second straight championship, as well as winning the Leading Goaltender Award for lowest GAA in the season. The Canucks would be moved to the NHL the next season in an expansion role. Gardner would be the starting goalie for the Canucks' first game in the NHL, a loss to the Los Angeles Kings. Garder would play 18 games for the Canucks that 1970-71 season with a 6-8-1 record. Gardner would also play in the AHL for the Rochester Americans for four games with a 0-1-3 record. In the 1971-72 season, Gardner would stay with the Canucks and play in 24 games and finish with a 3-14-3 record. Gardner moved to the WHA and the Los Angeles Sharks for the 1972-73 season, finishing with a 19-22-4 record in 49 games. Playing only two games for the Sharks in the 1973-74 season (both losses), Gardner would be traded to the Vancouver Blazers, playing in 28 games with a 4-21-1 record. Gardner was moved south the play in the Southern Hockey League with the Roanoke Valley Rebels for four games before retiring. Gardner passed away in November of 2006 in his home in Florida. From living the high life in Memphis to faking eye exams to being the first goalie in history for a new team Gardner experienced the up and down of hockey and showed how hard it was to keep a spot in the old days and he had to do what he needed to keep his spot and keep going. 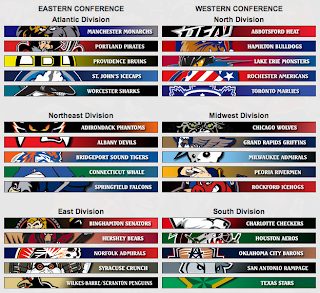 A crazy thing about the ECHL is that the league is just that-- the ECHL. The letters don't stand for anything anymore, especially with the acquisiton of another league. In any case, this league was started out of the ashes of the All-American Hockey League at the end of the 1987-88 season. The ECHL was known then as the East Coast Hockey League, as the teams were predominately on the East Coast-- oddly enough. The first season, the ECHL had five teams and within five years had 19. 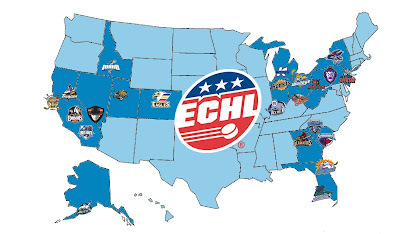 The ECHL soon expanded to more southern locales like Baton Rouge and Lafayette, Louisiana by the 1995-96 season, moving to New Orleans and Peoria in the 1997-98 season, while in the 2001-02 season, the league would see their peak at 29 teams under the East Coast Hockey League name. The name change to just letters would be in the 2003-04 season, when the West Coast Hockey League disbanded and joined up with the ECHL, creating a 31-team league for that season, spread out across the US-- including Alaska. 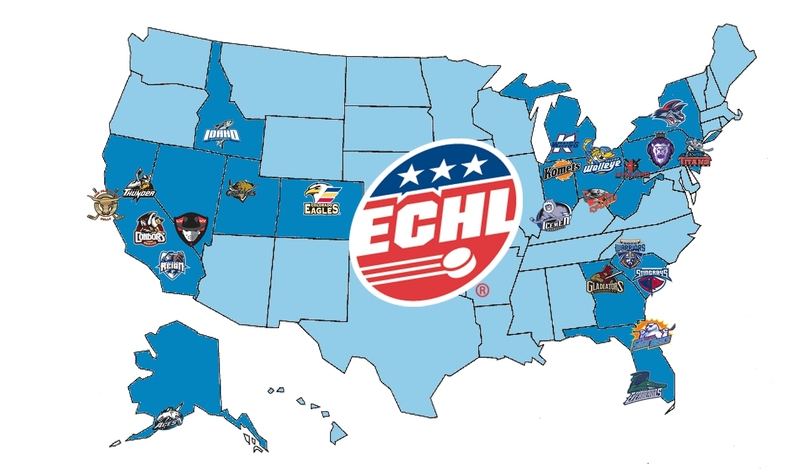 There have been trying times for the ECHL, but for the 2012-13 season-- the league will have 23 teams, two new expansion teams in Orlando and San Francisco, and picked up Fort Wayne and Evansville from the Central Hockey League. One of the biggest thing you'll see about the ECHL is how much they love when the alumni makes it to the NHL. Calling themselves the "Premier 'AA' Hockey League," the ECHL keeps a running total on the amount of alumni who have made it to at least one game in the NHL, which is at 490 after the 2011-12 season and 234 in the last seven years. 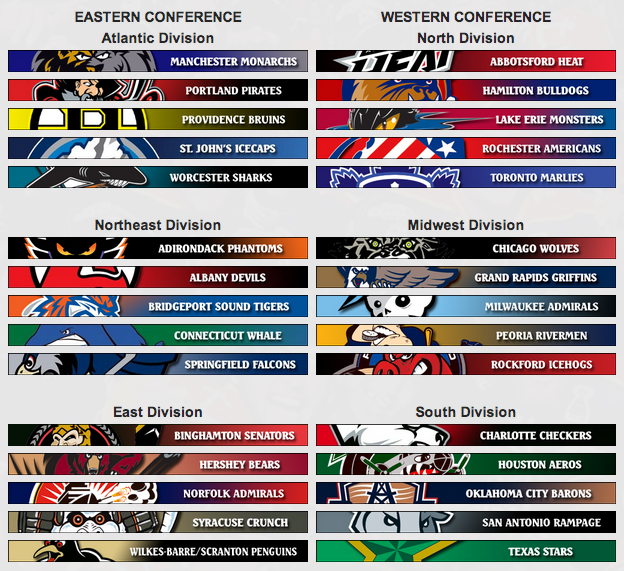 An interesting sidebar to the AA moniker is that not many teams use their ECHL affiliate. I pointed something out in April of this year how very few teams actually put their ECHL teams to good use. However, some teams like the Columbus Blue Jackets did just that with Allen York coming onto their roster and making a splash by coming directly from the ECHL to the NHL, bypassing the AHL entirely. Even though the honing of the player's skill happens in the AHL, the ECHL takes plenty of claim for their development-- rightfully or not is another story all together. The ECHL is also the league that the Johnstown Chiefs used to play in before the team folded and moved to Greenville and became the Road Warriors. The Chiefs played in the same arena that the infamous movie "Slap Shot" was filmed in and the team was named after the fictional one. The Chiefs were one of the founding members of the ECHL, but the longest tenured team now is the Wheeling Nailers, who started in the 1991-92 season and moved from Winston-Salem, North Carolina where they were called the Thunderbirds. With five divisions, two sides of the country, and untapped resources in Alaska; the ECHL is a very fun, spread out, and pretty talented league-- even if it does have some lifers in it. With a less corporate atmosphere, the ECHL is allow to have a lot of gimmick games and be able to show personality where other leagues may not want to. In a time were it'd be nice to have personality, the ECHL definitely helps fill some of that void. It wouldn't be a summer without a controversy with the Washington Capitals and their goaltending. This time, it could have been preventative and maybe it's just the inability for the one party to curve how they really feel....but they are screwed because they are cursed for not having a true personality and then when they slip-up, they are condemned for it. In any case, Michal Neuvirth gave an interview to a Czech website in regards to this coming season and there's many interesting points, mostly about Braden Holtby being his "weakest competition yet" and him advising Tomas Vokoun to go to Pittsburgh rather than Russia. You can check out the rest of the stuff thanks to the folks at Russian Machine Never Breaks who have a great translation of it. While many people believe this is Neuvirth's mouth writing a cheque his play can't cash, especially against Holtby, he could have a point and maybe the style of hockey that has been played-- as the lovely and talented Greg Wyshynski points out-- could have helped out Holtby's stat-line. Granted, Holtby does have a regular season record of 14-4-3, this could also be chalked up to the fact that the NHL level players hadn't figured him out. His time with the Hershey Bears last season was a decline of the 2010-11 season, but it could also be due to the jet-lag he had because of shuttling from AHL to NHL. Even so, it seems that he can get figured out if players and coaches have enough game-tape of him. Neuvirth small nagging injuries have plagued Neuvirth for the past two seasons, mostly lower-body injuries, but it makes you wonder if he would be able to actually go a full season without actually missing any time on the IR. Personally, that alone would make me wonder about his spot as the starting role, as well as his decline over the past couple of seasons-- which could be chalked up to the injuries or what Holtby will discover in a stat-line decline because of players figuring his style out. However, I think this is something that I wonder if the Capitals are slowly creeping up to the Philadelphia Flyers range when it comes to goaltending. 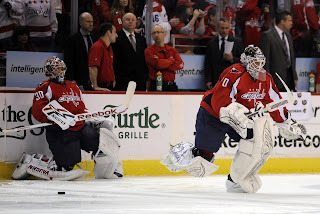 Since Olaf Kolzig unceremoniously left-- Neuvirth, Holtby, Vokoun, Jose Theodore, and Semyon Varlamov, have tried their hand in net, leaving coaches and fans wondering why they're in there over another. At the end of the day, you have to wonder what's going to happen with this and whether or not stability can be found in either of these two for the long-term with the Caps. Especially with Philipp Grubauer coming up through the ranks-- they could get even more pressure. Yet, with the goalies bickering amongst themselves, it could be an issue when the season starts and the attention put forth could be unneeded pressure on Neuvirth when he didn't need to actually go that way when questioned. For Neuvirth's sake, I hope that he's healthy enough to actually perform the way he thinks he can-- because it could be a huge bonus for the Caps. Though, if he can't-- the heat he may/will get over his comments will be immense. More over-- this has to be bulletin board material for Holtby, motivating him to be better than before to show how "weak" he can be. Ricci started his trek during the 1976-77 season with the Junior "B" Toronto Red Wings, while also spending seven games with the OHL's Niagara Falls Flyers-- Ricci's hometown team. The 1977-78 season, Ricci spent all of it with the Junior "B" Red Wings, while playing 52 games with Niagara Falls in the 1978-79 season, then taking them to the OHL Finals, but losing on points to the Peterborough Petes. Ricci would win the 1979 Dave Pinkney Award with Glen Ernst for lowest team GAA, as well as the F.W. Dinty Moore Award for lowest rookie GAA. One of the interesting things about Ricci is that he would always carry around a gallon of Niagara Falls distilled water jugs. While he used it to soak his contacts in, many of his teammates thought it was because he couldn't be too far away from his hometown at any time. The Pittsburgh Penguins would draft Ricci in the 5th round of the 1979 Draft and would play four games with the parent club, going 2-2-0; using his acrobatics to earn himself playing time behind a bad defensive team . 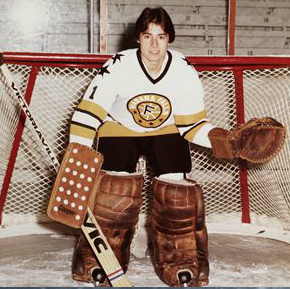 Most of the 1979-80 season would be spent in the IHL with the Grand Rapids Owls for 29 games and a 4.28 GAA.The 1980-81 season saw Ricci with the Penguins for nine games and post a 4-5-0 record, while he would move to the AHL's Binghamton Whalers for eight games and finishing with a 2-4-0 record. The bulk of the 1981-82 season, Ricci found his footing with the AHL's Erie Blades, playing for 40 games that season and compiling a 16-19-4 record; getting called up to Pittsburgh for three games-- all losses. For the 1982-83 season, Ricci went to the AHL's Baltimore Skipjacks for nine games and put up a 3-3-2 record, while getting a call-up to Pittsburgh to have a 1-2-0 record in his three games. In August 1983, Ricci and Pat Graham were traded to the Toronto Maple Leafs for Vincent Tremblay and Rocky Saganiuk. The 1983-84 season had Ricci split between the AHL's Newmarket Saints for 15 games, mostly in relief with a 3-4-1 record; then spending the other half of the season with the IHL's Muskegon Mohawks where he would go 1-11-1 in 13 games. 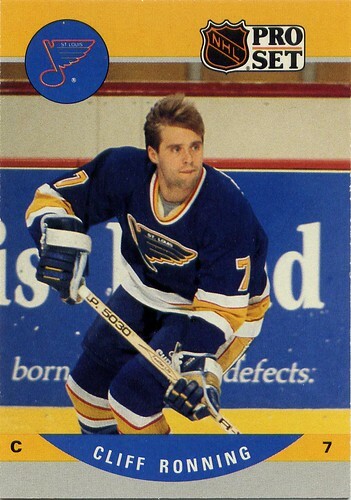 The 1984-85 season would be Ricci's last, as he played for the IHL's Peoria Rivermen and post a 4-3-0 record in seven appearances; then he would hang-up the pads after that season. Post-playing career, Ricci would help out with the family business-- taking ownership over the Hotel Fallsview in Niagara Falls, Ontario. Ricci sold the hotel in 2000. In June 2002, Ricci purchased the Mississiauga Ice Dogs from Don Cherry, selling the team to Chris Pronger and Mario Forgione in February 2003; less than a year after buying it. Ricci then was the head of trying to bring an OHL team back to Niagara Falls, with no results thus far. Currently, Ricci has his own goaltending consulting firm, Goalies Only Consulting. Ricci had very little time to show off what he could truly do and bounced around a lot-- but he at least remembered where his home was and seemed to take pride in that fact and take part of it with him-- even if it was just for his eyes. Though his NHL career was only 19 games long, he left an impression as being indirectly part of getting the Pens Mario Lemieux by getting the Tremblay. The AHL is the direct feeder system when it comes to the NHL and you'll see a lot of fans actually paying close attention to their AHL teams to see who is ready coming up through the pipeline of the team. Because of that, and a by-law, I believe; there are 30 teams-- one for each NHL team. They span from Newfoundland to British Columbia in Canada and in 16 States. Because of that 12 of the 30 AHL teams are owned by their parent clubs. One of those teams that are independent is also the longest standing team in the AHL-- the Hershey Bears, who are now the affiliate of the Washington Capitals. They have the most Calder Cup championships with 11; the last coming in 2010. It should be noted that the Connecticut Whale have the longest lineage dating back to the Providence Reds in the 1936-37 season-- the first year of the AHL, but the Bears have stayed in the same town with the same name since 1938. For the most part, the AHL was a predominantly Northeast region of the US league with spattering of Quebec and Ontario thrown in. However, with the "absorption" of six IHL teams and some ECHL moving upward into the AHL game; the league has expansion into the Midwest, Texas, and Western Canada. How west?? The Abbotsford Heat are the furthest team west and the closest team to them is the Oklahoma City Barons which is 2,100 miles away, while the Heat are 4,378 miles away from the St. John's IceCaps, the furthest team East. There's not much else to be said about the nuances when it comes to the AHL. It's a talented league where you can see a lot of the good young prospects who couldn't get the fast-track to the AHL with some of the career AHLers who may have never gotten the chance. The pace of the game is almost on par with the NHL product and it's something where you could actually enjoy the entertainment value, as well as the hockey, for a solid price at the box office. Should there be a lockout, you'll probably see a lot of the younger NHLers to be sent to the AHL to make sure they keep playing-- thus it would be a great idea to see a better talent on the ice. Even if there isn't a lockout and you have an AHL team in your area-- even if it's not the same as your parent club-- check it out to experience just one game of the next highest league in the North American hockey pipeline. This week's AGM isn't one you would think of because....well it was a career marred in downside rather than upside. It wasn't until he was on another continent for him to reach a top potential. While his North American career started bad and had a few bright spots-- after he left the strain of the NHL hopes, he was able to actually show his true worth. This week, the profile of Mike Bales. Bales started off his career with the Saskatchewan Junior League's Estevan Bruins, playing in 44 games with a 4.90 GAA; but it was good enough to get him onto The Ohio State University Buckeyes starting in the 1989-90 season where he would go 6-13-2 in 21 games. The Boston Bruins selected Bales in the fifth round, but Bales stayed with the Buckeyes for the 1990-91 season, posting an 11-24-3 record, then in the 1991-92 season; Bales put up an 11-20-5 record for the Buckeyes, leaving school after that season. 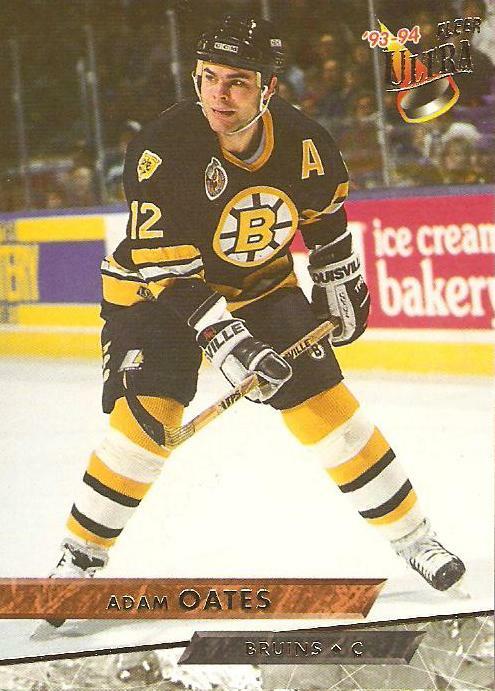 In the 1992-93 season, Bales went pro and would play mostly for the AHL's Providence Bruins as he would put together a 22-17-0 record; then going 0-2 in the playoffs, while also playing in a game for the Bruins in relief of John Blue, but did not factor in the decision. Bales stayed in Providence for the 1993-94 season, but have a dismal season with a 9-15-4 record. Bales signed on with the Ottawa Senators in the summer of 1994 and he would be placed with the PEI Senators for most of the 1994-95 season, posting a 25-16-3 record, as well as a 6-3 playoff record, though they would lose in the division semi-finals. Bales also appeared in a relief appearance for Ottawa that season-- not a factor for the win or loss. 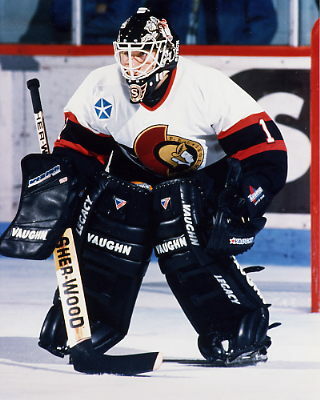 The 1995-96 season had Bales in the carousel for the Ottawa Senators goaltending, playing 20 games while going 2-14-1 while facing a barrage of shots-against. In PEI that season, Bales lost both games he appeared in. For the 1996-97 season, Bales was in the AHL, but for the Baltimore Bandits finishing the year with a 13-21-8 record in 47 games, while losing the only game he appeared in with Ottawa. The Buffalo Sabres signed Bales for the 1997-98 season, but would put him in the AHL for the Rochester Americans where Bales would play in 39 games and go 13-19-5 record. 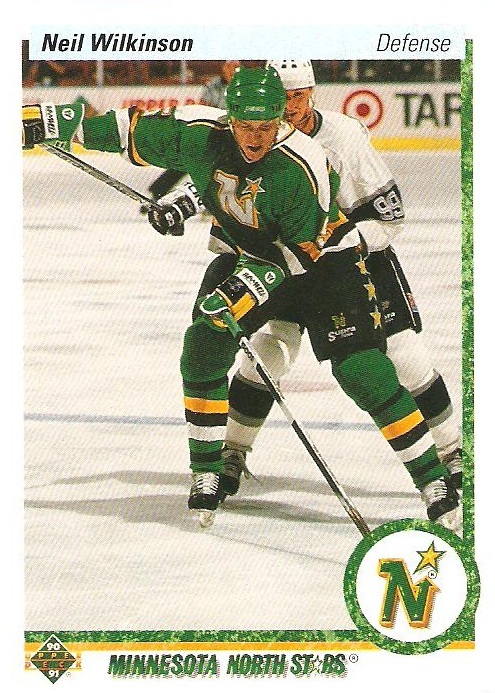 Bales then moved to the Dallas Stars organization, playing for their IHL affiliate of the Michigan K-Wings starting in the 1998-99 season; posting an 11-17-3 record that season and then a 9-9-5 record in 25 games during the 1999-2000 season. The Stars moved their affiliate to the Utah Grizzlies, as Bales would play 50 games in the 2000-01 season and compile a 22-19-3 record. With no chances in North America, Bales moved to Great Britain for the 2001-02 season with the Belfast Giants in the British Elite League, playing in 34 games, posting a 2.31 GAA, and winning Best Goaltender Award, as well as making the First Team All-Stars. Bales would move over to Germany for the 2002-03 season for ERC Ingolstadt, playing in 23 games there, while moving to Sweden in the 2003-04 season to play with Leksands IF for another 23 games. With the 2004-05 season, Bales went back to Germany and went to the second division Straubing Tigers where he would help them get a promotion into the Germae Elite League for the 2006-07 as Straubing won the promotion in the 2006 playoffs. Bales would leave Straubing in 2010 after playing in 250 games over six seasons. While Bales was signed by the Iserlohn Roosters for the 2010-11 season, it was only on an emergency basis and he never went over, thus ending his career. The Pittsburgh Penguins would sign Bales to be the goaltender development coach for their AHL, ECHL, and other prospects down their pipeline. The 2012-13 season will be his second with the team. It wasn't the most glamorous career and had many more potholes in the road rather than smooth sailing. It wasn't until he went overseas did he get his most success when he had matured more and didn't have the pressure of worrying of the shuttling back and forth from the minors to the top teams. Yet, he helped one franchise in Germany get promoted and make a name for himself enough to be a developmental coach. The owners don't like how the CBA is structured (of their own doing in-house, mind you) so why would they want to keep playing under it?? They would lose bargaining power with the NHLPA saying, "Hey, if this is okay enough for you to keep going-- why not keep it going??" It's hard to get any kind of roll-back once the players start to make money. Even with common sense being around, the hyperbole amongst many fans is running rampant-- especially with Donald Fehr playing the nice guy act saying the players would play past the expiration. Of course they would-- they'd still be making money. From people getting upset about Bettman about his comments, sports columnist painting the doom-and-gloom scenarios that riles up the troops, and then people saying that "the game as we know it will never be the same"-- it's hard to be a fan or actual reasonable human being during these times. First and foremost-- THERE IS OTHER HOCKEY OUTSIDE OF THE NHL!! I can't stress this enough people. Sure, the void will be vast with the NHL not around and that's a crying shame for the global scale of the game-- but there's plenty of other hockey out there that would enjoy your entertainment dollar at a small price. Sure, it's not the NHL hockey you're accustomed to, but at the same time-- it could be good for people to diversify themselves into the minor league or junior levels of play. When the NHL does comeback, the future stars would have already been seen by others. Hell, support your local minor hockey team even if there isn't an extended lockout or a lockout at all. Second, the rage against Bettman is silly, but understood. He's the NHL owner's speaker. While he has the commissioner title, the fact remains that his powers beyond what the owners give him is very limited. Bettman is at their beckon call and if he doesn't do what the owners want-- they will get someone who will-- which could be even worse than Bettman. Third, you have to love the likes of David Shoalts and the others who are already cancelling the season until the Winter Classic. Sure, that's a possibilty, but there's also a possibility that the season only gets delayed a day, a week, a month, whatever. The feeding of the already upset fan bases is something where they can feed off of for page views and recognition. While in some way, shape, or form we are all gloryhogs, but at the same time-- there's also a limit to it all. Fourth, just because the NHL is planning lockout, the fact that people are worried that games in September could be cancelled makes me snicker a bit. Sure, pre-season games are fun-- especially those in neutral locations like Baltimore, Brooklyn, Kansas City, and Vegas-- but the loss of them doesn't mean as much as many would like you to believe. As much as I would like to see some AHLers battle out for a spot on the roster or see star players just go through their motions-- cutting out the pre-season games all together probably isn't the worst thing for the players in terms that they won't have that added risk of injury during meaningless games. Donald Fehr said there's still significant time (though that's before the "meaningful gulf" comment) to get a deal done. Bill "Don't call me Steve Wilkos" Daly has said that in the past, as well. Some players aren't panicking at all of a lockout, while others are making contingency plans-- just in case. The fact the NHLPA hasn't put forth a counter-proposal yet is reason to believe that this process is going to be a tactical one and something that could bring about good things. Both sides have met more and had seemingly more meaningful conversations than that of the last labor meetings that started in the summer of 2004 should be a good sign.....but you can't put that forth through all the hyperbole being flung around by emotional fans. 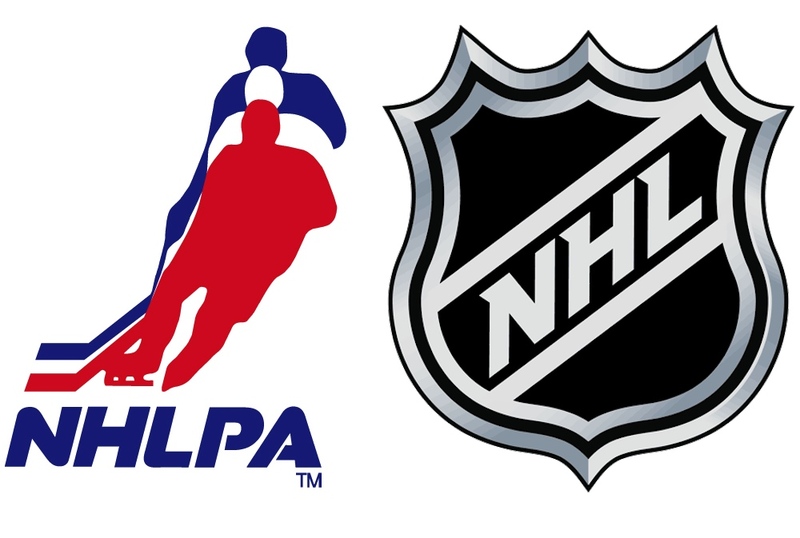 Should the NHLPA's proposal (rumored to be put forth Tuesday) be something that causes both sides to not talk for a couple weeks, then we should have a problem. However, with the extreme case the NHL put together and the NHLPA still meeting with the NHL for a couple days a week after that could mean that they are serious about getting something done in time. Outside of fans, the livelihood of both sides (read: money) is something that is of significant loss and that neither side wants. In the end, we're still 36 days away from a possible lockout and the true test will come with the NHLPA's counter-proposal and what that does to the owners. Even then, we'll be close to a month away from a lockout-- still a lot of time to go and bargain. While there hasn't been much going on this summer, the fact that every fan out there is turning into a pessimist all the sudden is somewhat expected and somewhat disappointing. Cooler heads will prevail in the end....but if it's before, slightly after, or really after the deadline remains to be seen. 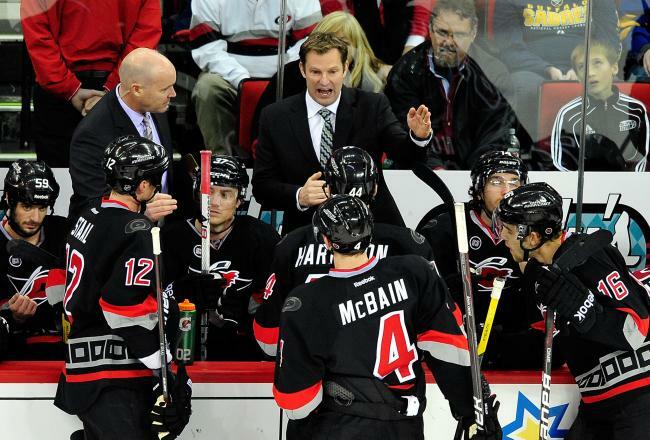 With all their acquisitions this summer, the Carolina Hurricanes are looking pretty decent when it comes to what they look forward to when it comes to the 2012-13 season. With the signing of Alex Semin, the trade for Jordan Staal, and the extension given to Jeff Skinner; they have their ducks lined up in a row for this year and beyond. Add those names to Eric Staal, Jussi Jokinen, and Tuomo Ruutu; the Hurricanes are looking pretty solid up front. One problem, while the ability to score is nice-- the ability to stop the other team for scoring is very nice. That's something that the Hurricanes may be missing, which seems obvious to many people who have looked at the Canes roster. Looking at the top-four for the Canes defense, it doesn't really strike too much fear into the hearts of many teams with a decent offense. 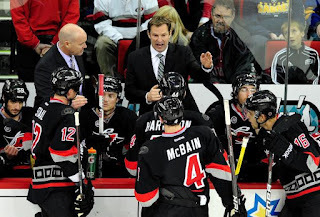 Not to say that Jamie McBain, Joni Pitkanen, Tim Gleason, and Justin Faulk aren't up to the task of being a huge surprise this coming season-- but I don't believe that the four of them (as well as a hidden Joe Corvo lurking) will compliment the offensive advances that the Hurricanes have tried to make this summer. Maybe Jay Harrison will help make the group of six a little more well-rounded, but it's....doubtful at best. While the likes of Ryan Murphy, M-A Gragnani, Bobby Sanguinetti, and Austin Levi coming up through the pipeline, the future could look a little brighter should those for be able to be convinced to stick around for the long haul, but if the Canes cannot groom younger defensemen-- signing the likes of Staal and Skinner for the long term may be putting the cart before the horse in hoping this will make some kind of contender for the next decade or so. Yet, in the present time, should the defense of the Hurricanes falter-- the onus will fall on Cam Ward. Despite his save percentage and GAA not showing it; Ward had the second most shots against (2,143) saves (1,951), but gave up the second most goals (182) in the NHL last season, where he played the 5th most games of all the NHL goalie last season at 68. He played a lot of games, so the stats will be up there, but he's almost the kind of guy who had the same knocks against him that M-A Fleury; a good, but not great goalie. Will Ward steal a game here and there?? Sure, and maybe with some goal support and with defensive help, it could be a lot more this season than in season's past-- but odds are he won't be able to do that night-in and night-out on his own. Ward does have a Cup ring and he is a guy who can bounce back from an off-year and can be very streaky-- but is there a point where he burns out from facing too many shots and being overplayed?? Justin Peters has a lot of talent, but I don't know if he's reliable enough to get more starts as the season wears on. The front-end for the Canes will be solid. Even if there's times where they slump a little-- the potential is pretty scary if they can hit on all cylinders for 55 or more games this season. The biggest thing is the back-end of the roster and if they can stop the puck and not make it the old-style, firewagon hockey that the 1980s used to have. While it'd be great for attention on the Canes games, the Canes fans may have years taken off their life for every 6-5 game that is being played. While last instalment had the last of a breed, this week's AGM was the first of a breed in equipment. Not only did he get fed up with what he had, he was surprised at the outcry against it to begin with. He stuck by his guns and was able to help get it worked into the goalie lexicon, which I'm sure many of the goalie fraternity are indebted for. This week, the profile of Emile Francis. Francis first started his journey with the North Battleford Beavers in the North Saskatchewan Junior League in the 1941-42 season, playing in four games, all losses. The 1942-43 season had Francis play eight games with North Battleford (no record given). A move east is what happened next for Francis, as he would join the Philadelphia Falcons for the 1943-44 season, playing in 14 games in the Eastern League, while he would spend the 1944-45 season with the Washington Lions in the same league, taking home league MVP honors for his stellar play in the 35 games there. Francis was called for military duty, but would play the 1945-46 season back in the Saskatchewan Junior League, this time the South Division playing for the Moose Jaw Canucks and going 18-0-0 in 18 games, helping the Canucks move to the Memorial Cup, where he would go 4-4 in eight games of tournament play. Francis also spent time with the Regina Capitals, though he would play only one game with them. Francis would be in Regina for the start of the 1946-47 season, but with a bit of a newer look. During the end of the 1945-46 season, Francis took a piece of his other favorite sport-- baseball-- and worked into the hockey lexicon, but using a first baseman's mitt and adding a wide cuff to it as a catching glove rather than using the same gloves his teammates wore. It helped Francis that next season in Regina, playing in 32 games, while then getting picked up by the Chicago Blackhawks, playing in 19 games and finishing with a 6-12-1 record. The bulk of the 1947-48 season, Francis played with the Blackhawks-- posting a 18-31-5 record in 54 games, but he would also spend time with the Kansas City Pla-mors of the USHL-- going 3-2-2 in seven appearances. 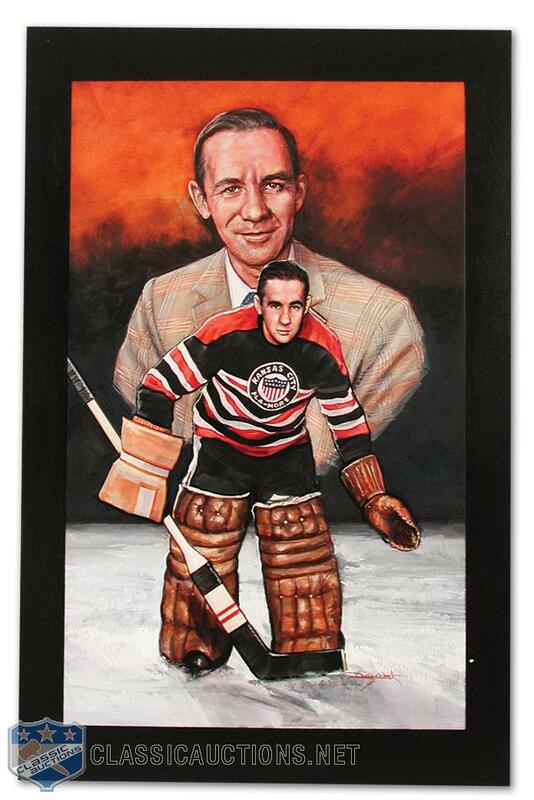 Before the 1948-49 campaign, Francis was traded with Alex Kaleta to the New York Rangers for Jim Henry. Francis would only spend two games with the Rangers that season (2-0-0) and spend the bulk of his time in the AHL with the New Haven Ramblers, finishing with a 15-27-7 record in 49 appearances. The 1949-50 season had Francis back in New Haven, playing in 68 games and putting up a record of 22-36-10; all while losing the only game he played for the Rangers that season. The Rangers changed AHL affiliation in the 1950-51 season to the Cincinnati Mohawks, where Francis would put up a 20-26-7 record in 53 games, while going 1-1-2 in five appearances for the Rangers. The 1951-52 season was much better for Francis in Cincinnati, as he would go 24-22-5 in 51 games and then 3-3 in six playoff appearances; as well as going 4-7-3 in 14 games for the Rangers. Francis moved to the WHL in the 1952-53 season, playing of the Vancouver Canucks for 70 games, posting a 32-28-10 record, then going 4-5 in nine playoff games. For the 1953-54 season, Francis left the WHL and signed onto the AHL's Cleveland Barons, going 37-28-0 in 65 games and went 7-2 in the playoffs, as the Barons won the Calder Cup. Francis returned to Cleveland for the 1954-55 season, putting up a 28-26-3 record in 57 games and then 1-2 in three playoff games. With the 1955-56 season, Francis would return to the WHL, but with the Saskatoon Quakers-- where he would go 27-33-8 in 68 games and 0-3 in the playoffs. Francis moved out west to the Seattle Americans in the 1956-57 season, posting a 35-26-7 record and 2-4 in six playoff games. The Victoria Cougars took Francis's services for the 1957-58 season, where he finished with an 18-47-2 record in 67 games. For the 1958-59 and 1959-60 season, Francis was playing for the Spokane Spokes, going 25-37-6 (1-3 in the playoffs) and 19-46-3 in those respective years. Francis was also loaned out to the Seattle Totems for a game in the 1959-60 season, winning that game. After that season, Francis would retire from playing. Francis didn't stay away from the game long, as he would be the head coach of the OHA's Guelph Royals before the New York Rangers would hire him as head coach from the 1965-66 season until the 1974-75 season and would coach the St. Louis Blues in the 1976-77 season and parts of the 1981-82 and 1982-83 seasons, finishing his coaching career with a 388-277-117 record. Francis was also the GM of the Blues from 1976 until 1983 and GM of the Hartford Whalers from 1983 until 1989. Francis was inducted into the Hockey Hall of Fame as a builder in 1982 and has a trophy named after him in the AHL for the champion of the North Division. While his NHL career lasted only 95 games, the innovation he brought to the goaltending position was a great leap forward and probably staved of injury for future generations coming up through the ranks. Add that to his ability to work in the front office, Franics's legacy stretched out further than his playing career could have imagined. There was a time that the Summer Olympics was a little more than just swimming and track events. Back in 1920, the Summer Games provided some chilly excitement, as it was the first time that figure skating and ice hockey were used during the Olympics. While it may seem a little odd at first, when you realize the 1920 "Summer" Olympics started in April and ended in September-- the first week of winter events weren't too far out of place in late April. Ice hockey wasn't available for Olympic use until the 1914 Olympics and were only chosen for the 1920 Olympics when the manager of the ice rink that was to be used in Antwerp, Belgium for figure skating said that they would not allow the Olympics to use their facility if ice hockey was not included in the Games. Therefore, three months before the Games were to begin, ice hockey was added to the menu to compete. Seven nations took part in the first hockey tournament: Canada, USA, Czechslovakia, Sweden, Belgium, Switzerland, and France. 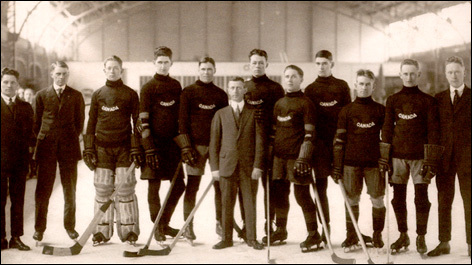 The Canadians sent the Winnipeg Falcons, who had won the Allan Cup for senior amateur champions, the USA had sent an all-star team of the best club teams after their tournament to send a representative was abandoned, Sweden sent bandy players who had little ice hockey experience, while the other nations had their own national teams. In the games, the "rover" position was used, thus having seven players on the ice, including the goalie, with the ice surface being 165 feet by 58.5 feet. Also, the games were split up into halves rather than periods. Also, the first games had a tournament system called the Bergvall System, which was created by Erik Bergvall. It was a system that had three rounds. The first round was to determine the Gold medalist, the remaining teams would then be back into a tournament for Silver, and then another tournament for those who didn't win Gold or Silver for the Bronze medal. This system really screwed over the Swedish team, who lost the Gold medal game, then the first round of the Silver medal, then losing in the final game of the Bronze medal event. They played six games while the Gold medalist Canadians played only three. Speaking of the first Gold medalists of the Games, Canadian had a decisive advantage of most of the teams, letting up only one goal in the Gold medal game to Sweden and scoring 29 goals in three games. The advantage was good because the Falcons had played together for the entire winter and coming off a big championship were hitting their stride perfectly. The Silver went to the USA, who only lost to Canada, giving up two goals and scoring 45 in three games. And while the idea now of hockey in the Summer Olympics is a bit off, it'd be fantastic for hockey fans who crave some game play in the summer and it wouldn't cause a stoppage during the middle of the year for those Olympic years. However, with the places the Summer Games are going, the ability to build a hockey arena would be rough at best, thus making it back to the Winter venues and where they will stay-- which is apropos to do, sure, but causes a lot of problems with it as well. But those first games were the start of something big. Hockey would move to the Winter Olympics for the 1924 Olympics and beyond, but it will always be a solid footnote for the first hockey medals were given out in the Summer Olympics.